Tired of filling out California business property tax forms by hand? 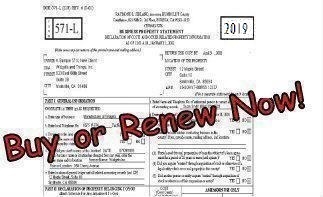 Tired of rewriting the same Form 571 information year after year? Then you need County Software's Forms571. Download our free trial version of Forms571 now and eliminate the tedious process of manually tracking and manually filling out the Business or Agricultural Property Statement. Or you may call and request a free copy of Forms571 on CD if you prefer. We also accept company checks and payment online. This Web page and its contents, images, and any other pages in the County Software hierarchy are copyright � 1997 County Software unless otherwise noted.